Research seminar: CONVERGENT REGULATORY EVOLUTION AND THE ORIGIN OF FLIGHTLESSNESS IN PALAEOGNATHOUS BIRDS. 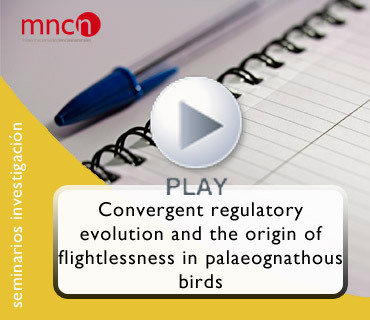 Seminario de investigación: Convergent regulatory evolution and the origin of flightlessness in palaeognathous birds. Convergent evolution, in which the same morphologies or behaviors evolve repeatedly, is a powerful indicator that natural selection has been at work. Yet we know little about the genomic drivers of convergent evolution, or whether the convergent loss of traits entails different genetic mechanisms than the convergent gain of traits. In this lecture I will present our recent analyses of the comparative genomics of an iconic group of flightless birds, the palaeognaths, which include the ostrich, emu, kiwis, and others flightless groups, along with the Neotropical tinamous, which can fly. Our phylogenomic analysis, as well as recent studies by other groups, strongly suggests that flight was lost multiple times in this group, a conclusion that clashes with a centuries-old scenario in which flight was lost just once in the common ancestor. Moreoever, I will demonstrate how we use detailed analyses of genes and non-coding regulatory regions to conclude that regulatory, not protein-coding, genomic changes drove the evolution of flightlessness. This scenario contrasts markedly with a similar analysis for convergent vocal learning in birds, which appears to be driven much more by protein evolution. Together these studies reveal how parallel genomic changes accompany convergent evolution of the phenotype and how natural selection operates in multiple lineages independently.